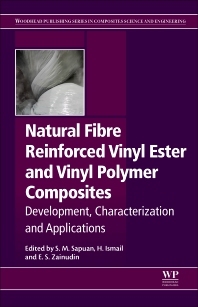 Natural Fiber Reinforced Vinyl Ester and Vinyl Polymer Composites: Characterization, Properties and Applications discusses recent advances on the development, characterization and application of natural fiber vinyl ester and vinyl polymers composites. Various types of vinyl ester and vinyl based polymers, such as poly(vinyl chloride) (PVC), low and high density polyethylene (LDPE and HDPE), polypropylene (PP), polyvinyl alcohol (PVA) and polyvinyl acetate (PVAc) are discussed. Chapters focus on different composite fabrication processes, such as compression moulding, hand lay-up, and pultrusion processes. Key themes covered include the properties and characterization of vinyl ester and vinyl polymers composites reinforced by natural fibers. The effect of fiber treatment and coupling agents on mechanical and physical properties of these materials is also evaluated. In addition to a determination of physical and mechanical properties, studies on thermal, degradation, swelling behavior, and the morphological properties of natural fiber reinforced vinyl ester and vinyl polymer composites is also presented. Professor Mohd Sapuan (S.M. Sapuan) was born on 25 September 1965, in Kampung Sungai Nibong, Kota Setia, Teluk Intan, Perak, Malaysia and earned his B.Eng degree in Mechanical Engineering from University of Newcastle, Australia in 1990. Afterward he continued his study and obtained his MSc from Loughborough University, UK in 1994 and finally Ph.D from De Montfort University, UK in 1998. Later on, he has managed to pursue other qualifications. In addition he presented 55 invited lectures in conferences and seminars. H. Ismail obtained his PhD from Loughborough University of Technology, United Kingdom. His research interests include natural fiber reinforced polymer composites, recycling of rubber and plastic wastes and biodegradable polymer. He has won many awards including Khwarizmi International Award 2000 from Iran, APCTT (Asia Pacific) 2000 International Award, ISESCO Prize in Science & Technology 2001, Gold Medal at the International Trade Fair IENA 2005, Nuremberg, Germany, Gold Medal at the 56th World Exhibition of Innovation and Research and New Technologies at Brussel, Belgium, Double Gold and Special Award from Russia at British Invention Show (BIS 2010), London and Gold Medal at 6th International Invention Fair in the Middle East (IIFME), Kuwait, 2013. He has published more than 400 research papers in various polymer ISI international journals, 10 books and 10 chapters in books and is currently one of the Editorial Board for Polymer Plastic Technology & Engineering (Marcel Dekker, USA), Research Journal of Environmental and Earth Sciences (Maxwell Science), ASEAN Engineering Journal, Iranian Journal of Energy and Environment, Iranian Polymer Journal (Springer), Central European Journal of Engineering (Springer), Journal of Composites and Biodegradable Polymers (Savvy Publishers) and J of Vinyl and Additive Technology (Wiley). E.S Zainudin is currently an associate professor in Mechanical & Manufacturing Engineering department and former head of Laboratory of Biocomposite Technology at Universiti Putra Malaysia. He earned his B.Eng degree in Mechanical & Materials Engineering from Universiti Kebangsaan Malaysia in 1998 and MSc & Ph.D from Universiti Putra Malaysia in 2002 and 2009 respectively. His research interests include natural fiber composites and mechanical & materials engineering. To date he has published more than 100 articles in journal & conference proceedings.